Now Chinese media followes (sic) dozens of US publications in reposting an article with the notification Attorney Taitz sent to Obama’s new attorney, Neil Eggleston, in regards to Obama’s use of a stolen CT Social Security number and fabricated IDs. Our main networks are still silent. No decisions from courts yet. Taitz cites Newsvine.com, a Seattle-based community-sourced news site. Taitz’ link is broken, but she says the article is at “china.newsvine.com,” so whoever posted the article (“seeded” is how they label copied content) put it in the China section. I say “whoever” because I was not able to find any article mentioning Taitz and Eggleston at Newsvine. In any case, this is not “Chinese media” in any sense. This is not to say that there aren’t articles about Orly Taitz at Newsvine. One of my favorites is the one titled: “Totally not crazy Orly Taitz running for California General.” It’s a hoot, and not too long. 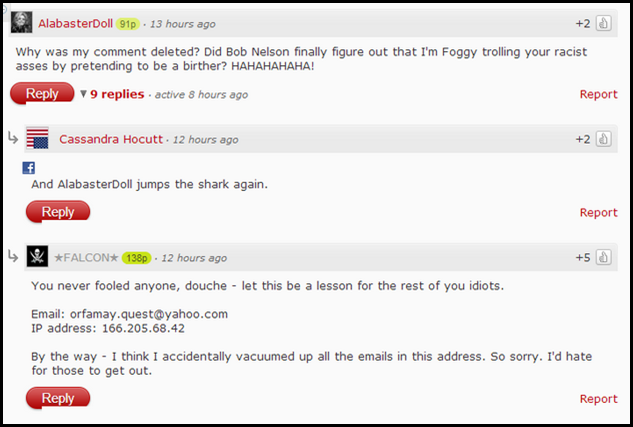 There’s some traffic on the Obot channels speculating what Zullo is going to come up with next. I have some significant doubts about it because I can’t believe Zullo would come out with such conspiracy claptrap that’s so far unrelated to Obama as to stretch credulity, feh. If it’s true, it will be a good cautionary tale reminding us that otherwise sensible people can get sucked into conspiracist nonsense. I better hit the books and start debunking this one just in case. Anti-birthers meet because they are an interesting group and enjoy each other’s company. I’ve been to two of the Obot meetups personally and it’s been a very good experience. These folks are intelligent and have fascinating personal stories. Now, shall we go through the list of fake documents from birthers (either created by them or used by them as authentic)? Birthers punk themselves far more often than Obots do. I count the trip to Atlanta for the Farrar hearing as a “meetup” although it wasn’t of the official ones. I still met lots of folks and their families and we went out to eat. A Google alert brought me to the article, “Impeach Obama? 2014 Impeachment Starts Operation American Spring,” at Inquisitr.com. 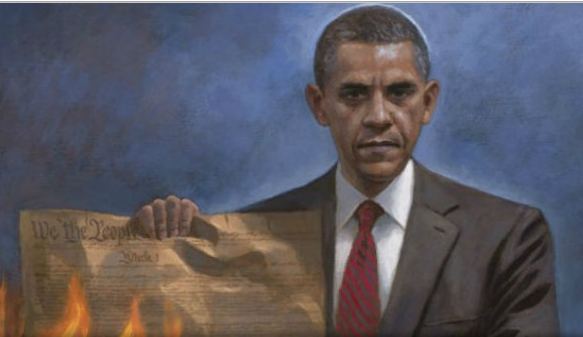 The article is headed by this Jon McNaughton portrait of a stern-faced Obama burning the US Constitution. 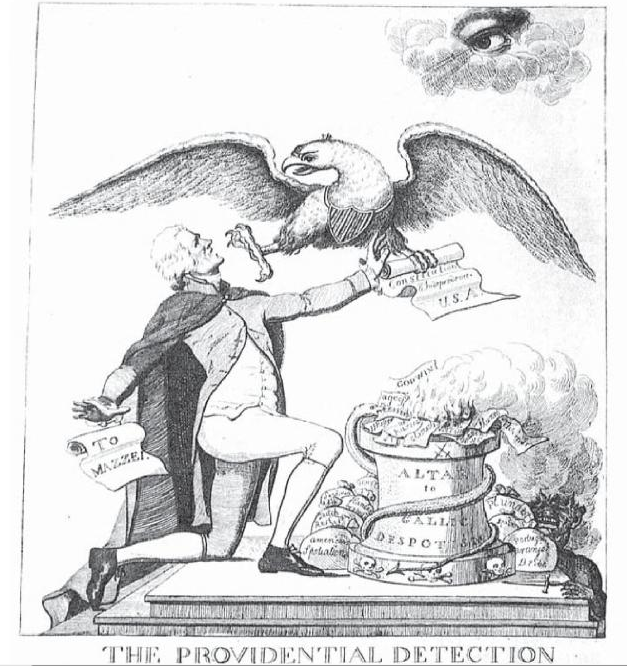 The preceding cartoon1 depicts the United States as symbolized by the eagle rescuing the Constitution from being burned by Thomas Jefferson. It literally refers to the defeat of Jefferson by Adams in the 1796 presidential election. 1A version of this image (with a less clear face) was incorrectly labeled as George Washington in a prior article on this blog. That has been corrected. I don’t know if that’s really an ancient Chinese saying (as it was presented to me) but it most certainly is a principle underlying this blog. For most of us, coincidences are delicious bits of life, but for the conspiracy theorist who lacks a good nonsense filter, they reveal the hidden machinations of conspiracy. Without coincidences, however viewed, this blog wouldn’t exist. The oldest thing I could find that I personally published about a coincidence was an article from 2005 titled (coincidentally) “Coincidence,” but there have been many others. What I find remarkable is how very many coincidences I find in the birther story. One coincidence is between two adjacent comments among the millions of birther comments on the Internet that I arrived at separately for different reasons. What are the chances that Orly Taitz and I would be rear-ended by a truck on the same day? One lawyer commenting on this blog said that he law school he heard a lot about Blackstone, but nothing about Vattel; nonetheless, when Obama taught law, the course syllabus had a reading from Vattel. And what about the crazy connection between Obama and the Skull & Bones Society I discovered. There are many other coincidences that I’ve written; here’s a word search for them. Falcon’s own remark is odd: “By the way – I think I accidentally vacuumed up all the emails in this address. So sorry. I’d hate for those to get out.” Of course, there is no way to accidentally access someone’s emails. Foggy then said that he had reported Falcon to the FBI for hacking his emails (read the exchange at The Fogbow), but then Falcon denied that he had gotten Foggy’s emails. Looks like Falcon was playing chicken and flinched first.